The landscape architect carefully weighed the geological botanical, historical, and even auditory context of this midsized San Juan Island residence with nearby views of a small horseshoe-shaped bay and distant mountains. The resulting design celebrates the strong views from the site while paying equal attentions to the intimacy of the woods. As the view remains blocked by the dense forest, a visitor must descend through the forest to the house. The walk offers a meandering engagement in all things minute and intimate. A pathway of local “alger green” rock marks the way. 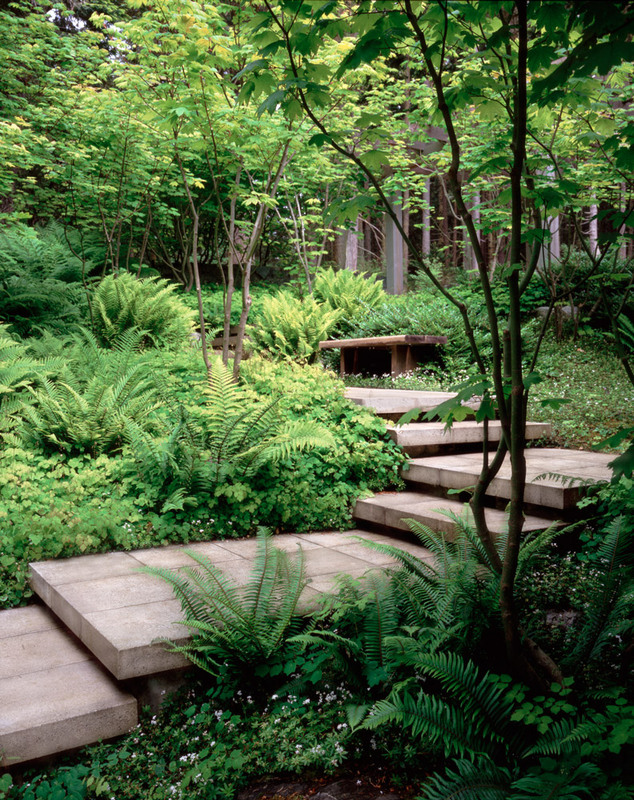 With the exception of two enclosed gardens, local and West Coast native plantings were favored. Reprinted with permission, Landscape Architecture, December 2009.